On adjacent walls there are stark reminders of a bloody past. Ballymurphy. McGurk’s Bar. Springhill-Whiterock. On the coffee table in the middle of this suitably sparse and airy waiting room is a copy of the Socialist Lawyer. It’s impossible to miss Paddy Murray’s legal offices on the lower Springfield Road, officially opened by former Police Ombudsman Nuala O’Loan in 2011. It’s Friday afternoon and the skies over west Belfast have been cleared by a good, hard rain. 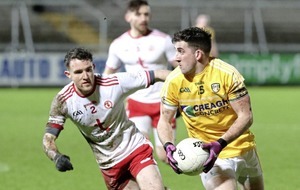 Now 41 and his playing days firmly in his rear view, the former Antrim and St Gall’s goalkeeper still looks fit enough to be pulling on his gloves. We skip across the gridlock of the Springfield Road to his other office. On the wall behind him is a hurl encased in glass accompanied by a photograph of Paddy with former All Blacks captain Sean Fitzpatrick. It’s 12 years this month Paddy Murray suffered the misfortune of missing out on the biggest game of his career – the 2006 All-Ireland Club final at Croke Park – due to a freak accident at home. You slide across the table a copy of the back page of The Irish News, dated Tuesday March 14, 2006. The headline reads: ‘Paddy holds out hope for a final day return’. The back page image is of Paddy on crutches, wearing a half smile, hoping against hope that he still might make a miraculous recovery and play against Connacht champions Salthill-Knocknacarra at Croke Park on St Patrick’s Day. Of course, there was no chance of him playing. You don’t recover from a broken foot in seven days. The story goes Paddy was playing football with his son Daniel in their back garden. He went to fetch the ball behind the portable goals and the corner slate of his garage roof became dislodged and landed on his right foot. His kicking foot. Leaning back in his chair, Paddy looks at the back page print-out and says: “It brings back a few memories. I loved playing for St Gall’s. The pinnacle of any GAA career is playing in an All-Ireland final with your club. A lot has happened over the last 12 years. You tell him that you still have doubts over the veracity of his account. “A lot of St Gall’s boys still don’t believe me,” Murray smiles. “I was in my garden playing with my son, Daniel, who was eight-years-old. He’s now 20 and doing a law degree at Queen’s. He shakes his head at the memory. “The chances of that happening, the timing… If it hit me on the arm it wouldn’t have been a big deal. If it hit me on the head I would have had a bump. “It was actually the corner slate and there was cement stuck to it. If it was just the slate I might have been okay, but it was the cement attached to it that made it heavier. “But it hit me on the right foot. As a goalkeeper, hitting kick-outs was a key part of the game. It broke a bone in my foot. John Rafferty had everything fine-tuned. Kick-out routines. Team selection. Possession. Possession was always king for St Gall’s. The dry run to Croke. The former Armagh footballer had led the Milltown club to the cusp of All-Ireland glory. Every box was ticked. What could go wrong? As soon as Murray injured his foot, he rang his manager. Murray was one of the team’s pranksters. Rafferty thought it was a wind-up. Murray went straight to the Royal Victoria Hospital where x-rays confirmed his worst fears. He put another call into Rafferty. He still didn’t believe his goalkeeper. “I actually had to put the doctor on and obviously then he knew it was real. “For a week there was a small chance that I might play. I think it was the Ulster rugby doctor who heard about this at the time and offered to help. I thought if I’d any chance this would be the guy. I’d been icing it. It was a small bone that was broken. “’Raff’ said: ‘Whatever you can do, your name is still on the team sheet.’ If you look back at the match programme my name is actually on it. So we held out to the last minute. I’d gone and seen the doctor and he said there was no chance and that was a couple of days before the final. 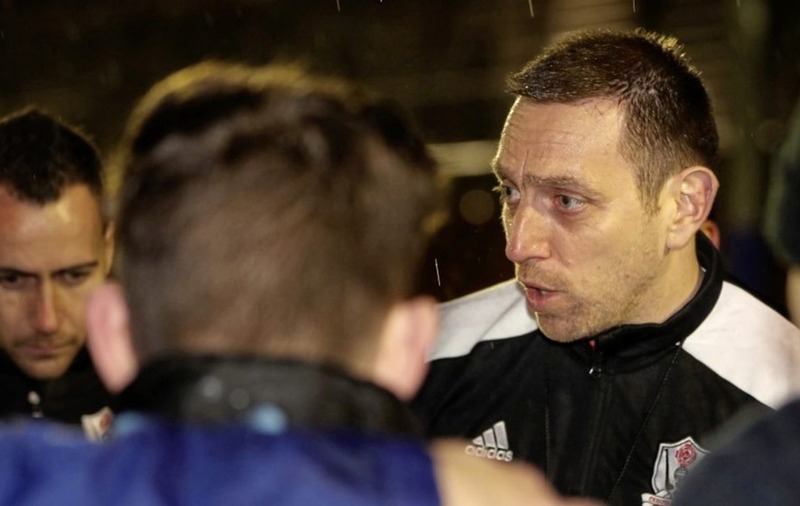 Ronan Gallagher, the former Fermanagh goalkeeper, stepped into the breach for the Falls Road men. 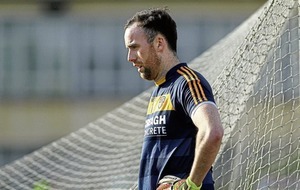 Murray travelled with the team to Croke Park and was as devastated as his team-mates afterwards. 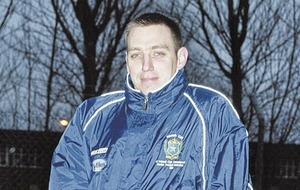 Recorded as the coldest day of 2006, St Gall’s fell short against a Michael Donnellan-inspired Salthill-Knocknacarra. They racked up 10 wides and lost on a 0-7 to 0-6 scoreline. In the corridors beneath the Hogan Stand, Rafferty was a broken man and the St Gall’s players inconsolable. “It was one of the coldest days. Anybody who was at the game always talks about the cold. I don’t remember the cold at all. That day came and went,” Murray says. After beating Bellaghy in the Ulster final and ambushing Nemo Rangers in the All-Ireland semi-finals in Portlaoise, St Gall’s were fancied to claim their first-ever All-Ireland crown. But it transpired their best days of the 2005/06 season were those priceless wins over the Derry champions and the kingpins of Cork. Murray’s recollection of those actual victories are practically zero. 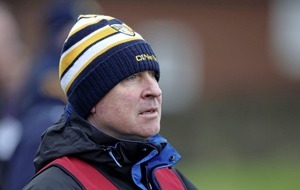 “Obviously it was this team’s first Ulster – we beat Bellaghy by a goal in Omagh. That was a big one. The St Gall’s team won Ulster in 1982 and some of the parents on that panel – PJ [O’Hare], Sean McGourty, Mickey Gribben – had sons playing. We really looked up to that ’82 team. “The things that stand out for me aren’t necessarily the games; it was going back to the club afterwards. We arrived at the lane and we walked into the club and the Ulster final was being played on the big screen. “I’m standing beside Ciaran McCrossan – great number six and a brilliant guy – and I hadn’t realised that Ciaran had scored the goal. He toe-poked the ball in from two yards – the least likely guy to score a goal. We had a beer and a laugh. For Murray, the details of their lauded victory over Nemo the following February are sketchy but he does remember the Cork men’s pre-match warm-up at O’Moore Park. “Nemo Rangers were this big club. What a history. I remember in the 1989 club final ‘Rossa were playing in the hurling and Nemo Rangers were playing in the football final. My uncle – Jim Fagan – was playing for ‘Rossa (my mother’s family are all ’Rossa). “And I remember this team coming on, the green and black jersey and in 2006 we were playing them. “We played them in Portlaoise. There’s a back pitch for the warm-up and John [Rafferty] had us pumped up. He was a great motivator. “Can we do this? We knew we’d a great team. We knew we’d ability. We’re playing one of the biggest club teams in the country, full of stars. “We took a bit of a lead and I remember looking at the faces of some of the Nemo players’ faces and they were in shock because we hit them hard. 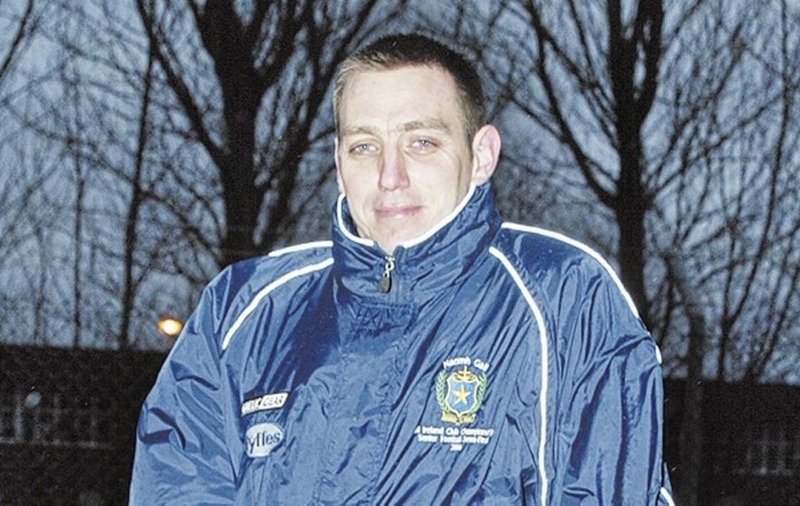 That St Gall’s team backboned Mickey Culbert’s Antrim side in the mid-Noughties: Colin Brady, Kieran McGourty, Kevin McGourty, Sean Kelly, Kevin Niblock, Aodhan Gallagher and Terry O’Neill. Murray quotes Fitzpatrick’s mantra: Good people make great teams. “I don’t have any lofty definition of culture,” he says. “For me, it was turn up for training on time, knowing what you had to sacrifice. If you had a part-time job as a student and it clashed with training, forget about it. “We just knew what had to be done. I didn’t play with many teams like that, even within St Gall’s, but that team knew what had to be done, they knew the sacrifices that had to be made. “Under Mickey Culbert [prior to Rafferty taking the reins], I remember it was January and we were running up and down hills in Falls Park in the dark, 30 or 40 guys. “Mickey came in and professionalised it. We knew there was something special happening. Crucially, the St Gall’s squad were young enough to come again and climb the All-Ireland summit. Four years later, they were back at Croke Park to compete in another All-Ireland final. By that stage, Murray had switched codes. “I always wanted to play rugby,” he says. “If Ireland were playing a rugby match and there was a GAA match on TV I would have watched the rugby. I always watched the rugby with my grandfather, the Five Nations as it was known then. In the space of four years, Murray had missed out on two of the biggest days of his playing career. “People say it must be my biggest regret, but I’m philosophical about it. It is what it is. “When St Gall’s got to the All-Ireland [in 2010] and won it, I was in the stands. I have to say that was difficult. One afternoon, Murray’s phone rang. It was a journalist who was writing a book. He had one more chapter to write. He remembers the book’s working title: The 10 most unlucky sportsmen in Ireland.